What a splendid idea this is and what an eclectic and affordable collection, putting together fourteen of the cream of Lyrita’s concerto recordings. These were made between 1967 when Imogen Holst was persuaded into the studio through to the 1990s — such an excellent idea. My mind started to run to works that were not included, perhaps the Frank Bridge Oration but there’s not much missing so let's enjoy what we have. The set opens with the youngest soloist represented, Lorraine McAslan. She has been making a name for herself not least in little known British repertoire. It was typical that when Lyrita produced this, one of Richard Itter’s last recordings coupled with two shorter works by the same composer, another emerged: that by Anthony Marwood on Hyperion. There is also a version by Philippe Graffin coupled with the Dvorak, a piece that clearly influenced this work. I have not heard these other two but I will say that the recording by Lyrita is one of their most vivid and the performance is wonderful. The Concerto falls into three movements. The substantial opening Allegro Maestoso increases in speed and dissipates into a passionate cadenza accompanied by a pedal note ending in a strong Allegro molto. The sensuous middle movement, to quote the notes by Paul Conway, is “alluring and songlike” with a central episode in compound time. The powerful finale is an Allegro molto incorporating Rondo forms. Another influence, and it must be remembered that Coleridge-Taylor was English by birth, is Elgar especially in the final movement. The Concerto was premiered soon after its composition at the Norfolk Connecticut Music Festival in June 1912. Tragically the composer died only a few months later on a return trip to his old London home. The Holst Invocation for cello and orchestra is an early work but in my view not an immature one. Imogen Holst in her book on her father’s music is dismissive (OUP 1951) commenting that "the work is not of any value" (p.36). I often feel that she didn’t want to be shown to be too approving of her father’s works. Certainly if she had heard this wonderful performance by Alexander Baillie and David Atherton she would have taken a different view as she might have done had she also heard Tim Hugh with David Lloyd-Jones on Naxos 8.553696 (an all-Holst orchestral collection). I find this Lyrita version the more passionate and committed. Imogen Holst is much more positive about one of her father’s last works, the Lyric Movement for viola and small orchestra. She comments (p.138) that “Holst recaptured the ardour which had possessed him at the very beginning” and she talks about its “sustained warmth”, when earlier she often talked about his music’s “coldness and isolation” (page 37). She felt sufficiently enamoured with the work to elicit from the English Chamber Orchestra, who knew her well, a beautifully sensitive performance. She also had the major advantage of the great violist Cecil Aronowitz and the whole is most immaculately recorded. Ms Holst devoted about five pages of her book to the Double Concerto which she analysed in detail and obviously admires. She opens her comments with “The concerto is fugal in construction and bitonal in language”. Paul Conway in his extensive and specially written notes quite rightly points out “the technique is not used to create dissonances”. The work is not strictly fugal but its three connected movements can be said to be consistently polyphonic. The first is a Scherzo in which the ghosts of Uranus and even Mercury seem to hover. Half of the Lament is for the two violins and the finale led by the timpani is a Variations and Ground over a memorably obsessive modal melody which begins in 2/2 but spends much of its time in Holst’s favourite 7/4 time. There are complex and ingenious cross-rhythms making for a stirring and exciting ending. The recording is a little more ‘boxy’ but perfectly clear. In between these Holst works is trapped Finzi’s desperately beautiful Introit for small orchestra and violin, the soloist not being heard until almost a minute into the piece. It was a great coup of the late Richard Itter to encourage Sir Adrian Boult, then in 1978 regrettably retired from the BBC, to record several English works with which he had at one time been associated. A Finzi LP came out of that initiative the contents of which were later issued on a Lyrita CD. I don’t suppose that Rodney Friend’s association with Boult in this piece will ever be bettered. This comes from another of Richard Itter’s last recording sessions for Lyrita Recorded Edition, the label which he had founded in the 1950s. It was also one of Vernon Handley’s last sessions in which he was to record the Piano and Cello Concertos by a composer rarely heard, William Busch. Being of German parentage Busch studied in Weimar but a melancholic, wistful, English pastoralism imbues his concerto. It's not surprising to learn that Busch was a close friend of Gerald Finzi. The late John Amis wrote the original notes and he knew Busch whom he describes as a “gentle person with a dark sallow face”. The Concerto is unusual in that it starts with a solo cello soliloquy. The modal quality of the ideas hangs a shadow over the whole work. The orchestra emerges and as the movement progresses the tempo quickens into its Allegro con spirito. The middle movement, the most Finzian, sings with long lyrical lines and warm orchestration. The finale has touches of Walton about it and is quite exciting when Busch allows the Allegro material its head. Quite often, including in the cadenza, the impetus dissipates into a reflective sadness; after all this is a wartime work. Its difficult to imagine how Raphael Wallfisch’s interpretation could ever be bettered, and sadly we shall probably never find out. Of all the British composers whose music benefited from Lyrita exposure that of Ernest John Moeran probably owed Lyrita the most. Piano music at first, then Moeran’s widow Piers Coetmore recorded the Cello Concerto and Cello Sonata although with unconvincing success. The Symphony also appeared. For some time however this was the only recording of Violin Concerto one could find and it took up, despite its just thirty-four minute duration, an entire LP. Now on CD it has been joined by versions on Chandos with Lydia Mordkovitch also with Handley, which I have, and by Tasmin Little and Andrew Davis, which I have not heard. According to Geoffrey Self in his book ‘The Music of E.J. Moeran’ (Toccata Press 1986) “It was an Irish Concerto that Moeran intended to write”. Moeran had been greatly encouraged in his early days by Hamilton Harty whose Violin Concerto he much admired. Moeran’s format, with a very moderate Allegro followed by a Vivace-Rondo and ending in a ten minute slow movement, was unusual. The first movement was started on Valentia Island, one of the country’s most westerly points, but completed at Kenmare, County Kerry. The Rondo "expresses the spirit of the summer fairs in Kerry" (p. 134) … "The retrospective third movement originated during the Autumn of 1941. In its concluding pages it reflects the calm experience in Southern Ireland … before the gales begin". At the time John Georgiadis was a somewhat surprising choice as the violinist in this the first ever recording of this work. He had, up to that point been leader of the LSO who play so warmly and sensitively for him and for Handley. After this recording he became a regular soloist for the next thirty or more years. In comparison with Mordkovitch I would say that the latter sees the work a little more as a showpiece and is less reflective at times but she does allow more rhythmic excitement to come to the fore especially in the first movement. I have always enjoyed this Rohan de Saram performance of the Rubbra Soliloquy especially so since I heard him play Rubbra’s Cello Sonata in a memorial concert in Oxford in 1986. There are other fine versions of Soliloquy by Raphael Sommer (Carlton 15656 91032) also with Vernon Handley which was taken down in 1976 in the presence of the composer. Raphael Wallfisch recorded the piece, again under Handley (White Line WHL2153), the former being practically three minutes faster. For me de Saram is the more passionate and expressive. There is also a rare recording of the piece played by Jacqueline du Pré on Cello Classics but I have not heard this. Rubbra wrote the piece during the war whilst on active duty and it was performed in 1944. The opening is like a Sarabande - Lento e calmo. Apart from a brief faster section – pastoral siciliano - which enters at over half way through, the tempo is mainly the same throughout. The subtle scoring includes two horns and timpani. Some of the composers in this boxed set espoused dodecaphonic writing. That was so for Roberto Gerhard but not in the 1940s; at least not completely, as this work demonstrates. As Anthony Payne wrote in a Musical Times review of 1974, “the breadth of Gerhard’s style at that time encompassed a sensitive bitonality with intermittent serial technique”. He adds later that the work needs “something more than the efficient performance it receives here under Colin Davis. Yfrah Neaman is a sensitive soloist”. It has also to be admitted that the recording is not out of the top drawer. I bought the original Argo LP coupled with the marvellous Fourth Symphony and hardly ever played the concerto, probably because I felt the same way as Payne. The performance was added to the Lyrita CD catalogue only a few years ago but I was coming back to it now after a couple of decades. It is a three-movement work with a Largo as the middle section. This segues into an Allegretto Placido. Either side are substantial Allegros. To illustrate what an eclectic work this is let me point out the long, lyrical lines of the opening, using ideas from an earlier Concertino for Strings of 1928. Also notable is the almost romantic richness of the harmony and orchestration in the second movement. This same movement deploys the very same tone row used by Schoenberg in his Fourth Quartet. It's worth mentioning that the finale uses the ‘Marseillaise’, recalling the fall of France in 1940. A Catalan folk song also puts in an appearance, bringing to mind Gerhard’s earlier pre-war compositions like the ballet Pandora and remembering that he was born near Barcelona, the Catalan heart-land. Oddly enough it all hangs together and I am glad to have become reacquainted with the piece although I still feel that the third movement could be a little shorter ... or perhaps the orchestra were not quite at their best. Another of the great violinists that Richard Itter persuaded into his studio was Manoug Parikian (1920-1987). He had given the first performance of Elizabeth Maconchy’s Serenata Concertante in 1963 and twenty years later committed it to an LP coupled with her Symphony for Double String Orchestra. 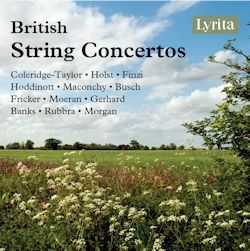 Maconchy was a great composer for strings (writing thirteen quartets) and Lyrita's CD of these orchestral works also included her Music for Strings. She wrote the programme notes for the original LP and in them she comments that the concertante is in a “chamber music style rather than a grand orchestral manner”. On the other hand she also allowed the soloist “considerable scope for display”. Although the work starts in dissonant aggression it is a sunny piece. With a lively 5/8 Scherzo being placed second, a mainly Allegro Ritmico first movement and an Allegro Vigoroso fourth movement, this work is constantly on the edge of excitement. I am very fond of it. The Concerto for Violin and small orchestra was not originally a Lyrita recording but one rescued by Richard Itter from Decca/Argo’s deletions. The concerto won, in 1951, an Arts Council Festival of Britain prize. Francis Routh, in his book 'Contemporary British Music' (MacDonald, London, 1972 - online here) describes it as “severe and astringent” but now it seems to me that it falls utterly into the late-romantic category. It's interesting to consider that in that book Fricker is given a whole chapter to himself amounting to thirteen pages. Up to that point Fricker had written four symphonies. He went on to write two more and yet now his music seems to have vanished into “thin, thin air”. Fricker was prolific, a catalogue published by Schotts in 1980 takes us up to Op. 85. Perhaps Fricker lost out in the UK because of his appointment in 1980 at the University of California in Santa Barbara, a prestigious post certainly but one which meant that he lost his profile and found himself in amongst the burgeoning minimalist movement with which he had limited sympathy. Yfrah Neaman (1923-2003), whom I knew when I was a student, was a great believer in new works be they by professionals or students. He is in great form in this concerto. The three movements have many exacting passages and much complex interplay with the chamber orchestra. The first opens with a slow introduction. The ideas from that movement re-emerge towards the end of the exciting ensuing Allegro and also in the cadenza of the Allegro vivo finale. The middle movement is a lyrical and magically scored Andante. The work is fashioned neatly, well constructed and expresses itself directly and clearly. I remember, as a fan of Lyrita, buying the LP of David Morgan’s two orchestral works on the ‘off-chance’ and being much impressed. In fact I have tended to prefer the other piece on that LP, Contrasts which was written eight years later. I was quite upset and shocked to hear of the composer’s early death of a heart attack at 55 and then the disappearance of his name. This oblivion was possibly linked to his move to Canada when the UK promptly forgot about him. The Violin Concerto caused quite a stir when first performed in Prague where Morgan was a student for a while after studies with Alan Bush in London. Its uninhibited expressiveness obviously appealed to all especially to Erich Gruenberg (b. 1924) who I suspect pushed for its recording. Morgan was indeed fortunate to have such an advocate and such a record company whose high standards still mean that the recording quality of this and all of the works herein presented are in keeping with the CD age. The work is in three movements with the cadenza placed at the end of the central scherzo. The outer moments, each in a sort of sonata form, are subtly scored but there are no fewer than fourteen percussion instruments. These help to create a mysterious atmosphere at the beginning and end of the first movement. The bongos help to create rhythmic excitement elsewhere particularly at the work's final coda. Speeds are balanced and the material is memorable. In fact it’s an outstanding work and one we are never likely to meet in the concert hall. As some might recall, there was a time when the BBC regularly played music by the Australian Don Banks in programmes like ‘Music in Our Time’. In the above-mentioned book by Routh, Banks is allotted a ten-page chapter. He was a truly international figure and espoused his own form of serial technique. The BBC commissioned this concerto for the 1968 Proms. It was not originally a Lyrita recording but was rescued by Richard Itter from its original LP-only format. The solo part is extraordinarily demanding but Yfrah Neaman again seemed to relish the sort of power and formidable technique required. Norman del Mar never shied away from difficult scores. The first movement is, in substance, one long nine-minute cadenza with violent orchestral outbursts helped by a barrage of percussion. The opening Lento fuses effortlessly into an insecure Allegro tempo. The next movement marked Andante cantabile is rather unsettling and almost fails in its quest to be a slow movement. The Risoluto finale has at least two challenging cadenzas but also a slow, nocturnal passage that, despite its shortness, is a sort of slow movement, which never really happens. The relationship between the soloist and orchestra is not entirely resolved by the vicious final bars. There is much anger in this atonal work. Apart from this work Banks’ music has mostly vanished without trace. Alun Hoddinott’s compositions were predominantly orchestral and instrumental. Lyrita treated him generously in issuing several symphonies, sinfoniettas and concertos. His harmonic language in Nocturnes and Cadenzas is very free and can’t be pinned down but it is not serial. Hoddinott did however dabble in serialism in the 1960s. The form of Nocturnes and Cadenzas is very satisfying, starting with a darkly hued Lento - in effect a nocturne. I have always thought Hoddinott's orchestration very special and particular. This is a reminder that he normally preferred to compose at night. Then comes the first cello cadenza which elaborates freely on some of the opening material. The central section is a crepuscular scherzo and trio, which segues into another (shorter) cadenza. The work ends with a further slow, mysterious section marked Adagio molto. Sir Charles Groves was in charge of the Philharmonia at a time when many felt the orchestra was at its best. Moray Welsh clearly found the beauty and passion of the piece to his liking. So this is an historic collection for all sorts of reasons. These recordings will be listened to for many years to come. The heyday of Lyrita was an extraordinarily rich period for British music and for performers who were committed to it. With Richard Itter, difficult as he apparently was, at the helm and accepting nothing but the highest standards, these are recordings to cherish.